Well, that is the first month of 2016 nearly over with! This month has really dragged, there has been so much going on! 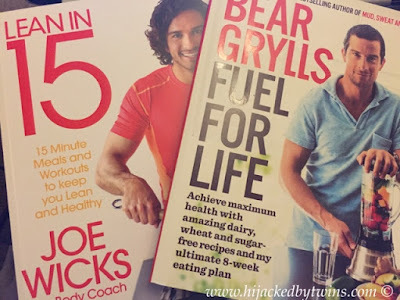 This weeks has seen me having a vegan week, a sick day for the twins, a surprise in Joseph's lolly, a busy day in the garden for the Hubby and a lot of foodie pictures. On Sunday the Hubby was busy on the gardens latest project. Yet more puppy proofing has been needed. As the weather has been so wet they have turned a lot of the lawn into mud. 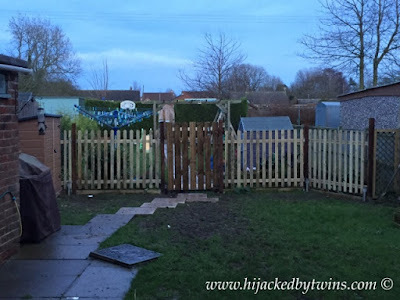 To make it easier he has sectioned off the first third of the garden and put fencing and made a gate so that they are just in one part and cannot make any more mess or destruction. On Monday was my first vegan day. After reading a lot of books I thought that I would try it for a week to see if I could do it. 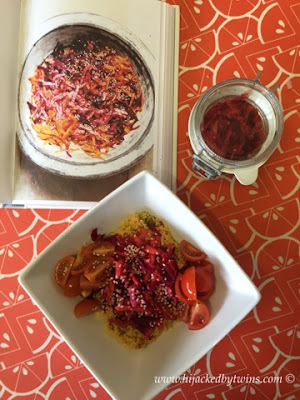 This was my delicious lunch inspired by Deliciously Ella Everyday. 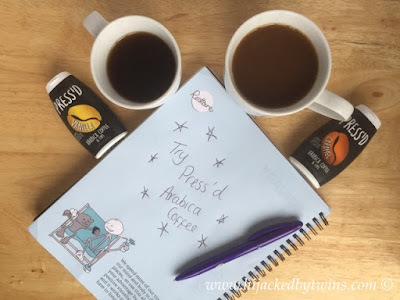 Monday was also a sick day for the twins thanks to a tummy bug. Tuesday was a catch up day after the twins being at home on the Monday. I got lots of foodie pictures taken for posts. 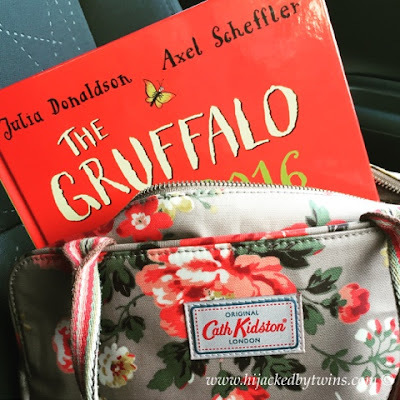 On Wednesday the twins asked for a Gruffalo lunch and this was the result. This led to more Gruffalo lunches which you can read about here. After the success of Wednesdays lunch after I collected the twins we went shopping for more Gruffalo ingredients. When Joseph came home after school the first thing he said to me was "Mum, do you want a Drumstick lolly?" I said no thanks and then he showed me what had happened! As he was chewing on it he got it stuck on his teeth and it pulled it clean out! It wasn't even wobbly. Needless to say, Drumsticks are now banned from the house! I mentioned that on Monday I was trying to have a vegan week. Well I have been pleasantly surprised how much I have enjoyed it. I will not be going 100% vegan because I love cheese, eggs and a few dairy bits like yogurt and ice cream too much but I will be going 90% vegetarian and only having meat as the odd treat. I really have not missed meat as I thought I would and have even cooked meat and not wanted it. Both the hubby and I are both wanting to lead a healthier eating diet so are reading a lot of healthy eating books! 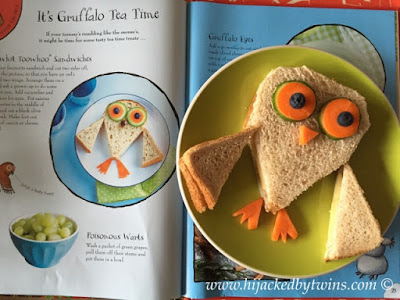 We love that Gruffalo annual, and the owl sandwich is very cute. I don't think I could go vegan, obviously some salads or soups are vegan without being specially vegan. And oh my at the tooth lolly. Oh wow! 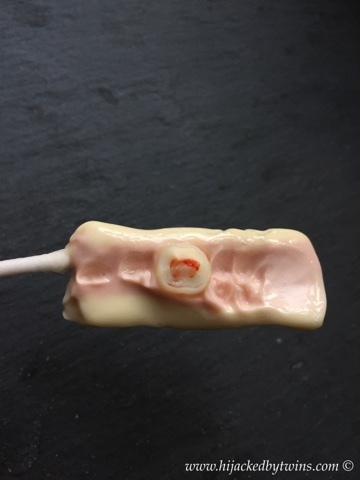 That lolly and the tooth. Eek! I could never go vegan, or veggie either have to say I like my meat too much, happy to have a few meat free days in a week but no more. Look forward to seeing some of the meals pictured on here. Glad the twins have got over their tummy bug. Oh dear at the tooth coming out, I quite like drum stick lollies myself. I remember losing a tooth that way as a child! I'm already struggling to get a photo a day, and it's only January! I loathe Drumsticks for the same reason! I lost a tooth as a child the same way but at least mine was wobbly! ha ha the the drumstick photo did make me smile but mostly because i could imagine him asking you if you wanted a lolly hoping you would say yes!! I had that happen to me as a kid with Highland toffee and a wham bar! My daughter was threatening to go vegan for a while - I'm not sure I could cope with cooking all the different meals! I've heard so many good things about Deliciously Ella though. Well done you as this meal looks amazing! January really has dragged hasn't it? ewww that just reminded me of when I was about 9 and I lost a tooth eating some opal fruits!! Mine was wobbly though haha. Oh the drumstick....!!! My kids love those and have had some annoy wobbly teeth that needed to come out but wouldn't, that would have done it! However I like them....but not sure after seeing that. He will have a hole for a while won't he.